Every Halloween I make myself a costume. I feel that Halloween is one of the holidays that is possibly more fun as an adult. This year as part of my costume as the Man in the Yellow Hat from Curious George I would need yellow pants. I looked online and in stores, but alas bright yellow pants were no where to be found. While at a local clothing store shopping for a yellow shirt I found some white cotton pants perfect for dyeing on clearance. I have dyed fabric in the past, but not in many years and I reviewed online tutorials, carefully read the instructions on the package of Rit dye, and talked with some of my tie-dye loving friends to make sure I didn’t make any mistakes. I only had one pair of pants and therefore only one shot at getting the dyeing done right. The back story on my costume this year goes as follows. I was visiting my niece for a week. During my visit we watched many episodes of the cartoon Curious George together. The cartoon is about her favorite monkey getting into all sorts of adventures due to his curious nature. After my visit I decided that the man in the yellow hat would make the perfect Halloween costume. Unlike last years Kung Fu panda costume, this year I had the added requirement that my costume be something in which I could dance. 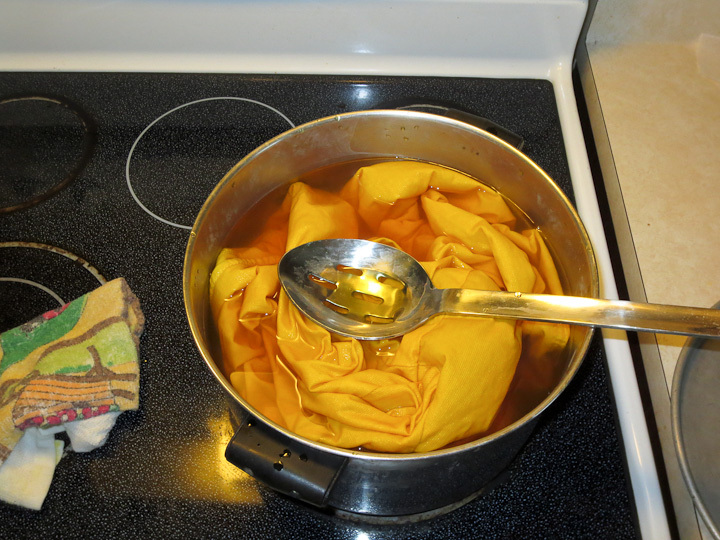 If you want to dye fabric, be it pants as in my case or anything else I strongly suggest you read the Tips for success on the Rit Dye website. You will find all of the basic info you need there. 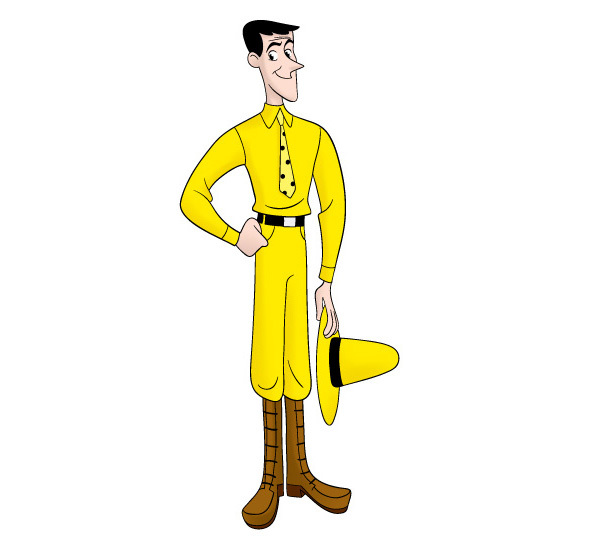 I remembered that synthetic fibers dyed poorly from previous experiences and made sure that the pants I purchased for my Curious George The Man in the Yellow Hat Costume were 100% cotton. Gathering all of the items you need ahead of time makes it an easy process. 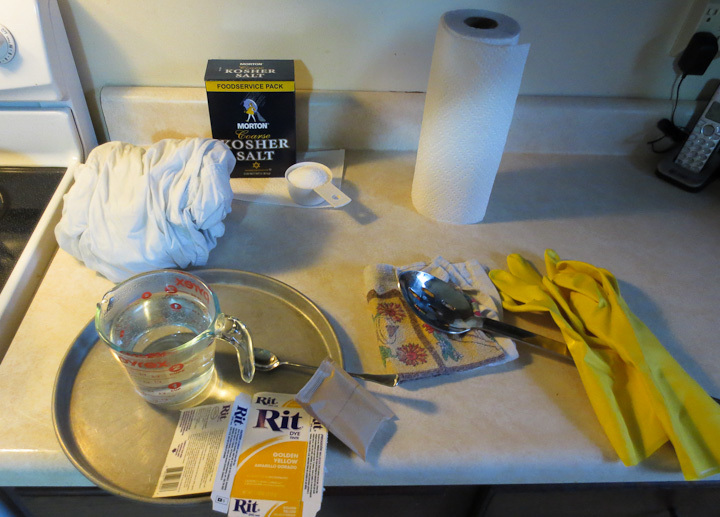 I used rubber gloves, a tray, a large SS pot, Stainless Steel slotted spoon, sacrificial towel, paper towels, I pre-measured the salt I would add to the bath, a glass measuring cup for pre-dissolving the solid dye powder, and paper towels (in case of catastrophe). If you aren’t capable of being meticulously careful, use lots of newspaper to catch splatters and drips of the dye before they stain everything in your kitchen. I used the stove top method and a large pot. I was not willing to risk dyeing the washing machine and I only had the one article of clothing to dye. Dissolve the dye powder in very hot water in a small glass cup before adding it to your bath. Don’t skip this step! Make sure all of the dye flakes are completely dissolved in the small cup before adding to bath. Buy and wear the long rubber gloves. The dye stains you and it takes a while for it to fade away. Use Stainless steel everything. You never know when you might have a bad reaction with a different metal, it’s not worth ruining your project. 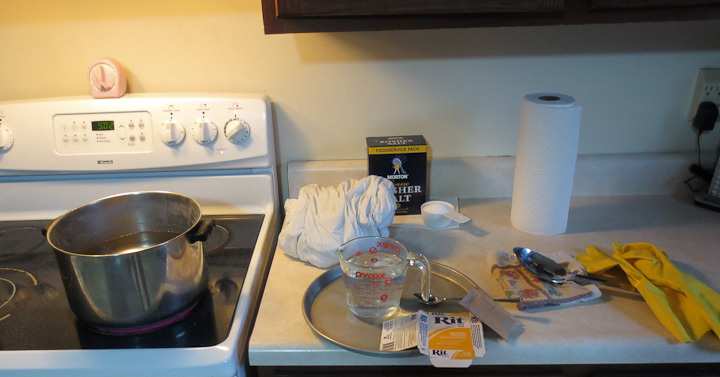 Make a mild bleach solution before you start in case you get any dye on the floor, counter, etc a few drops after wiping up the spill quickly remove any color left by the dye. I used a large stainless steel pot to dye my Man in the Yellow Hat pants a nice bright yellow. You will notice the liquid is orange in the pot, I was concerned about this during the project but had faith in the Rit dye. The pants took the dye well. I kept them hot on the stove stirring continuously for about 30 minutes. I lifted them out and inverted them once in the middle to ensure all of the fabric was getting saturated evenly with the dye. While handling your wet fabric/dye solution be meticulous. The dye will stain Formica counters, granite, plastic, porcelain stovetops, and just about anything else that is not stainless steel or glass. I had a sacrificial towel on hand to instantly soak up any drips or drops that escaped before they could do any dyeing. A bleach solution helps if you do stain your counter with a few drops accidentally. Here I am in the finished costume. It is an awful lot of yellow isn’t it? This is my favorite photo from Halloween this year. I actually look good in it, and of course there is a beautiful women on my arm. This particular photo was taken at the Noche Latina Halloween Party at the Ryles in Cambridge, MA. Tuesday night is a great night to dance Salsa at the Ryles Jazz Club in Cambridge. The night starts off with awesome on1 salsa lessons by Hedwidge J Luis and the rest of the Noche Latina salsa dance company. If you find yourself in the Boston area looking for fun on a Tuesday night, check out the Salsa night at the Ryles. As you can see in the above photo, the dyed pants came out an almost perfect match to the rest of my costume. The shirt I bought on the same clearance rack as the white cotton pants. The tie was a challenge. I struggled to find a neck tie in just the right yellow without any pattern. I finally found my Curious George Man in the Yellow Hat Costume necktie here at Cheap-neckties.com. I then carefully added the polka dots by hand with a new black sharpie marker using printed photos from the cartoon as a guide. Stay tuned for another post on how to make a felt hat for a Curious George Man in the Yellow Hat Costume.